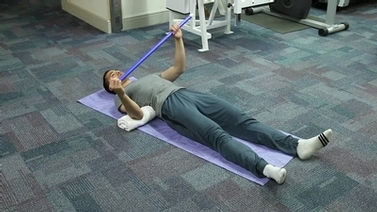 SPEAKER 1: Assisted external rotation at 90 degrees. 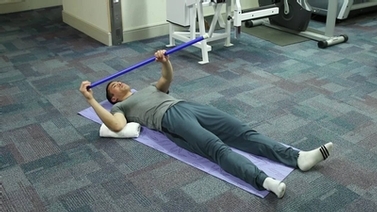 With towel under elbow to maintain level of the shoulder, arm at 90 degrees, elbow 90, wrist straight, use uninvolved side to rotate arm out away from body. Part of a series of shoulder range of motion exercises demonstrated by Cornell Physical Therapy.